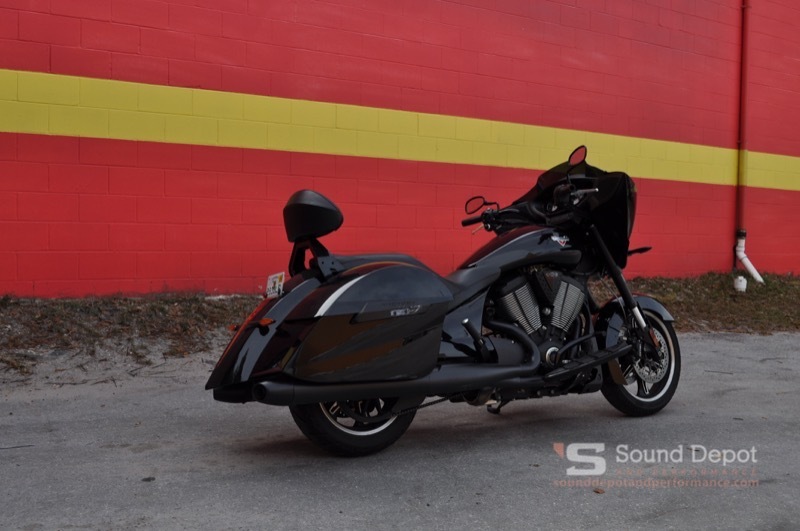 A client from here in Gainesville recently brought his 2018 Victory Cross Country motorcycle to Sound Depot and Performance in search of an audio system. The bike comes from the factory with provisions for speakers in the fairing and a spot for an application specific radio, but the client knew we could give him more features and better performance. After inspecting the motorcycle and talking to the client about how he wanted the system to work, we designed a cool upgrade that would sound amazing. The Pioneer radio was a great fit for this system. The first step was to choose a source unit for the Victory Cross Country audio system. The client wanted SiriusXM satellite radio and to be able to control the system from his smartphone. We suggested the MVH-S501BS digital media receiver from Pioneer. This single-DIN radio includes the ability to play MP3, WMA, AAC, WAV and FLAC audio files from a USB stick and can be controlled using the Pioneer Advanced Remote Control (ARC) app on the customer’s smartphone. 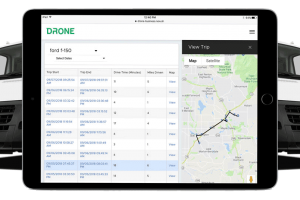 With all the features and functions accessible remotely, we mounted the radio vertically in the right-side saddlebag and enclosed it in a surface-mount radio pod. The antenna for the SXV300v1 satellite radio tuner is mounted just forward of the radio to provide optimal sensitivity. Our upgrades have this bike sounding better while retaining the stock look. The volume knob for the system was conveniently mounted under the left controls. The next step was to install a set of Rockford Fosgate TMS5 motorcycle speakers in the front fairing. 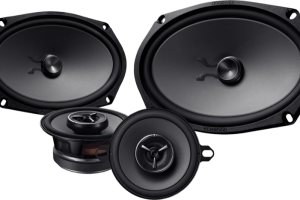 These speakers fit perfectly into the factory locations, and their Element Ready design ensures that they will sound great and last for years. 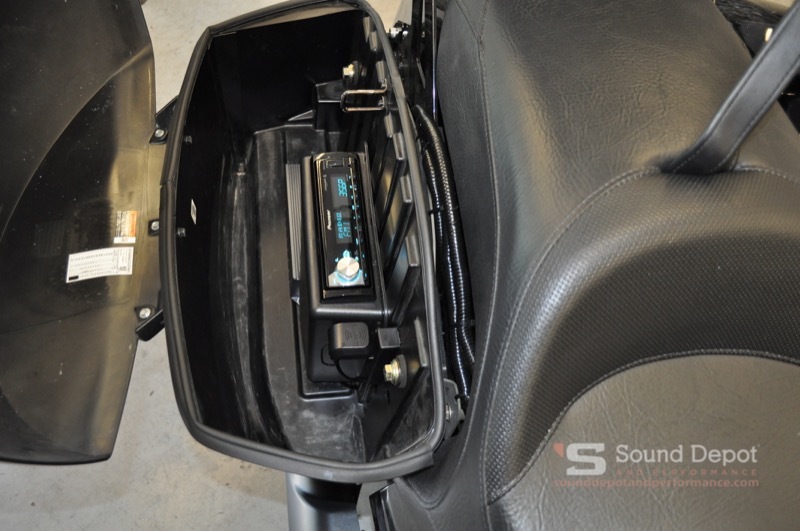 We installed a JL Audio MX280/4 four-channel amp in the left-side saddlebag and configured it as a two-channel to provide up to 140 watts to each of the speakers. We added an IBR70 remote level control knob just under the left handlebar to serve as an easily accessible master volume control for the system. The Metra IBR70 is water-resistant and includes a compact surface-mount pod that looks right at home in front of the rider. 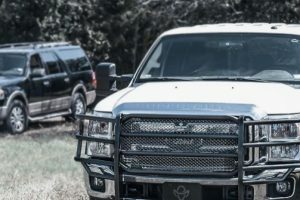 With the new audio equipment installed on the Victory Cross Country and the system components configured to work with each other, it was time for the client to return to Sound Depot and Performance to listen to the system for the first time. He was blown away by how great it sounded and loved that we were able to integrate everything into the bike so seamlessly. 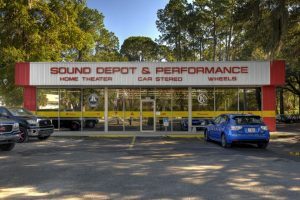 If you are in the Gainesville area and are interested in adding an audio system to your motorcycle, boat, ATV or side-by-side, drop into our store and speak with one of our product specialists. They’d be happy to work with you to design something amazing! For more information, give us call or send an e-mail using our online contact page.